Who would have thought that in bushranger country there would be another shootout in the Supercars championship where the underdogs came through? A visit to freezing Winton Raceway was expected to be a processional affair but the results showed that the meeting was anything but with two overlooked drivers sharing the spoils over the Winton SuperSprint weekend. While the championship order didn’t shuffle around as much as some would have wanted, now having eight winners so far in the season has showed that the racing is unpredictable and as exciting as ever. Fabian Coulthard – Following a tough start to the season, Coulthard converted a front row start in to a win on Sunday, a timely victory given his recent struggles which have seen him overshadowed by his team-mate. The seasoned driver started race one of the weekend on the front row but made a shocking start, dropping to fourth at the end of the opening lap. He stayed in that position to bring the car home just outside of the podium placings, but ahead of team-mate McLaughlin. Race two again saw him start from second in another Shell Ford front-row lockout, but a much better launch off the line gave him the lead, which is where he remained. The win is his first since Sydney Motorsport Park last year and comes at a time where his position within the Shell V-Power Racing Team had been questioned due to a lack of form. With only one previous podium to his name for 2018, Coulthard will be hoping this victory sparks a turnaround in fortunes as he chases a 408 point gap to team-mate and championship leader McLaughlin. 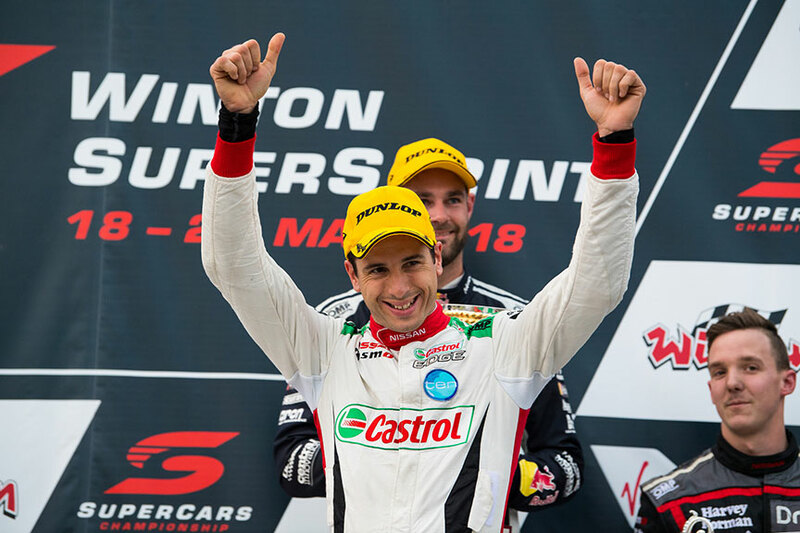 Rick Kelly broke through for an unexpected, emotional and ironic win at Winton, keeping a cool head to take a popular victory in Saturday’s 120km sprint race. After qualifying on the second row of the grid, a good start and pit stop strategy effectively promoted him to second where it looked like he would stay. However, a late safety car looked to have put paid to his challenge thanks to the cars behind him being on fresher rubber. But after McLaughlin ran slightly wide at the restart, Kelly dived down the inside at turn 3 to inherit the lead holding off Scott Pye to win his first race since Sandown in 2011 and the first for Nissan since Hidden Valley in 2016. Ironically, the win comes in the same week that Nissan announced its departure from Supercars at the end of this year, putting an end to the partnership with Kelly Racing which has been in place since 2013. Shane van Gisbergen may have qualified lower than expected across the Winton SuperSprint weekend, but the 2016 series champion showed his determination to never give up by taking two podium finishes and narrowing McLaughlin’s championship lead in the process. Starting 11th for race one, a long first stint without his lap speed tapering off meant that he took on a fresh set of rubber later in the race than anyone. Despite probably having the speed to win, he had to settle for third after the late safety car call-out. Sunday’s qualifying was better and the Red Bull Holden Racing Team again decided to run him longer in his stints, giving him the best possibility to attack at the end. He picked off McLaughlin and looked like he would catch Coulthard but he lost lap speed in the last 10 laps, having to settle for second. The podium finishes are a welcome return for the man who has had his fair share of mechanical dramas this year. Having clawed back the deficit to 131 points, van Gisbergen will be eager for his team to remedy its qualifying woes. David Reynolds entered the weekend sitting third in the championship standings but thanks to two poor outings, he’s now dropped to fourth and over 300 points adrift of the lead. For the first time in Reynolds’ career at Erebus Motorsport, he was out-qualified by his team-mate only managing 17th on the grid for race one as Anton De Pasquale qualified ninth. Being caught in the opening lap melee, Reynolds sustained damaged which saw him parked up for a number of laps, eventually coming home 25th. His qualifying for race two was even worse, finishing stone cold last at the end of the session. A fight back through the race saw him finish 15th, but way behind his title rivals who finished up on the podium. Despite a good start to the year, Reynolds finds himself tumbling down the order and will need to draw on that early season form if he wants to be a genuine contender for the title. Simona De Silvestro – After a career-best finish in the previous round De Silvestro failed to fire on a weekend where her team-mates finished strongly, getting herself in to trouble which reflected in the results. Even though year two in Supercars has been built up as a time for her to show her talent given her track knowledge, the Nissan driver qualified 23rd for race one and was caught up in two incidents, both earning her time penalties which saw her finish 22nd. Race two wasn’t much better, starting 21st and ending up in 23rd by the end, while two of her team-mates were in the top ten with one just outside in 11th. Being caught up in other peoples problems doesn’t help, but De Silvestro will need to start futher up the grid to get herself out of trouble and in a position to progress. Tickford Racing has continued to struggle this year with another below average weekend in Winton capping off a bad run for the ex-Ford factory team. Even though Mark Winterbottom was their best qualifier for race one taking seventh, he dropped to 10th by the end, although still ahead of team-mates Chaz Mostert (14th), Richie Stanaway (21st) and Cam Waters (DNF). Race two saw Mostert qualify highest in fifth but he struggled to convert the speed in to race pace, finishing 10th. Winterbottom hoped for a birthday gift in Sunday’s race but could only manage 20th place, while Cam Waters again had driveline issues finishing dead last. The only highlight of the Winton SuperSprint for Tickford Racing came as rookie Stanaway put his demons behind him, finishing ninth in what is his best solo finish so far in Supercars after his terrible start to the season.The Melbourne based squad will yet again need to turn their luck around if they’re going to remain relevant in this year’s championship battle. Darwin is the next stop on the calendar. A four-week break before then allows teams a chance to breathe and get in a test day before making the long trek to the top end. Action kicks off on the 15th of June.